Until Wednesday, I was not familiar with the use of "sync" to stand for a music synchronization license - that is, a license to use a piece of music in a visual setting such as a movie, video game, or commercial. The negotiations involved can be Byzantine and very, very slow, in part because the music's metadata is so often wrong or missing. In one such case, described at Music 4.5's seminar on developing new deals and business models for sync (Flash), it took ten years to get the wrong answer from a label to the apparently simple question: who owns the rights to this track on this compilation album? The surprise: this portion of the music business is just as frustrated as activists with the state of online copyright enforcement. They don't love the Digital Millennium Copyright Act (2000) any more than we do. We worry about unfair takedowns of non-infringing material and bans on circumvention tools; they hate that the Act's Safe Harbor grants YouTube and Facebook protection from liability as long as they remove content when told it's infringing. Google's automated infringement detection software, ContentID, I heard Wednesday, enables the "value gap", which the music industry has been fretting about for several years now because the sites have no motivation to create licensing systems. There is some logic there. However, where activists want to loosen copyright, enable fair use, and restore the public domain, they want to dump Safe Harbor, either by developing a technological bypass; or change the law; or by getting FaceTube to devise a fairer, more transparent revenue split. "Instagram," said one, "has never paid the music industry but is infringing copyright every day." To most of us, "online music" means subscription-based streaming services like Spotify or download services like Amazon and iTunes. For many younger people, especially Americans though, YouTube is their jukebox. Pex estimates that 84% of YouTube videos contain at least ten seconds of music. Google says ContentID matches 99.5% of those, and then they are either removed or monetized. But, Pex argues, 65% of those videos remain unclaimed and therefore provide no revenue. Worse, as streaming grows, downloads are crashing. There's a detectable attitude that if they can fix licensing on YouTube they will have cracked it for all sites hosting "creator-generated content". It's a fair complaint that ContentID was built to protect YouTube from liability, not to enable revenues to flow to rights holders. We can also all agree that the present system means millions of small-time creators are locked out of using most commercial music. The dancing baby case took eight years to decide that the background existence of a Prince song in a 29-second home video of a toddler dancing was fair use. But sync, too, was designed for businesses negotiating with businesses. Most creators might indeed be willing to pay to legally use commercial music if licensing were quick, simple, and cheap. There is also a question of whether today's ad revenues are sustainable; a graphic I can't find showed that the payout per view is shrinking. Bloomberg finds that increasingly winning YouTubers are taking all with little left for the very long tail. The twist in the tale is this. MP3 players unbundled albums into songs as separate marketable items. Many artists were frustrated by the loss of control inherent in enabling mix tapes at scale. Wednesday's discussion heralded the next step: unbundling the music itself, breaking it apart into individual beats, phrases and bars, each licensable. One speaker suggested scenarios. The "content" you want to enjoy is 42 minutes long but your commute is only 38 minutes. You might trim some "unnecessary dialogue" and rearrange the rest so now it fits! My reaction: try saying "unnecessary dialogue" to Aaron Sorkin and let's see how that goes. I have other doubts. I bet "rearranging" will take longer than watching the four minutes. Speeding up the player slightly achieves the same result, and you can do that *now* for free (try really blown it. More useful was the suggestion that hearing-impaired people could benefit from being able to tweak the mix to fade the background noise and music in a pub scene to make the actors easier to understand. But there, too, we actually already have closed captions. It's clear, however, that the scenarios may be wrong, but the unbundling probably isn't. In this world, we won't be talking about music, but "music objects". Many will be very low-value...but the value of the total catalogue might rise. The BBC has an experiment up already: The Mermaid's Tears, an "object-based radio drama" in which you can choose to follow any one of the three characters to experience the story. Smash these things together, and you see a very odd world coming at us. It's hard to see how fair use survives a system that aims to license "music objects" rather than "music". In 1990, Pamela Samuelson warned about copyright maximlism. That agenda does not appear to have gone away. 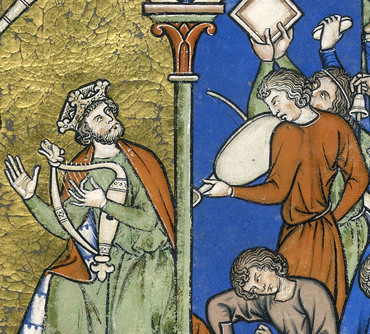 Illustrations: King David dancing before the Ark of the Covenant, 'Maciejowski Bible', Paris ca. 1240 (via Discarding Images.